To coincide with this week’s international break and a dearth of football on the television, attention throughout the media has focussed on the controversies which are wreaking havoc in the game. Dives, elbows and stamps have been universally condemned, individuals, none more so than Liverpool’s Luis Suarez, constantly vilified. Their actions are, however, compounded by the selective blindness coursing through the game’s governing body in this country. The fall-out from another weekend of high-octane Barclay’s Premier League football has highlighted a growing concern with footballing values in this country. In the wake of Luis Suarez’s comical dive at Anfield on Sunday, Stoke City manager Tony Pulis called the Uruguayan an embarrassment and demanded retrospective punishment. Suarez is the latest in a line of comic pantomime villains, following in the footsteps of Jurgen Klinsmann, Robert Pires, Cristiano Ronaldo and Didier Drogba. Diving has become a contentious issue in football throughout the British Isles, but one does not need to blame the influx of foreigners – a convenient scapegoat – but look closer to home to more of the real problems undermining the national game. 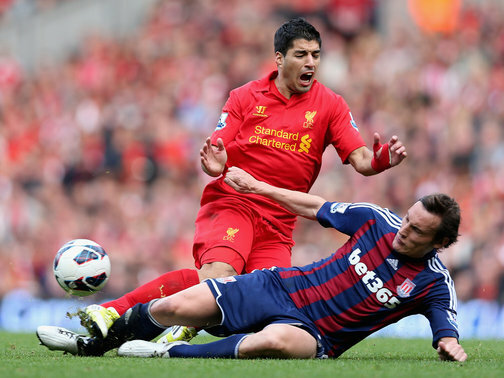 During his post-match tirade on Sunday Pulis neglected to acknowledge a stamp from Robert Huth on Luis Suarez or a series of over-the-top bone-crunching challenges from Dean Whitehead and Ryan Shawcross that marked the over-physicality of Stoke’s approach to the game. For all the furore about diving and its connotations with cheating, acts of violent play that risk careers are far more detrimental to the game’s public image – no one needs reminding of Shawcross’ horror tackle on Aaron Ramsey in 2010, which left the Arsenal midfielder with a double fracture in his lower right leg. Stoke City and Tony Pulis have received much praise from within the media in the last four years for employing ‘uncompromising’ tactics that have ensured their continual safety in the top flight. They suffer from a marked lack of ambition, one that is never called into a question due to the very nature of survival tactics. These on-field dramas are not the only actions of footballers that have come in for heavy criticism over the weekend. The national perception of footballers has plummeted to unparalleled depths, their scrambled values universally exposed. The escalation of the fallout from John Terry’s ban for racially abusing Anton Ferdinand rumbled on into international week after Ashley Cole refused to let the issue die. ‘Twatgate’ as it has effectively become known as is indicative of the FA’s lack of responsibility for its own players, whilst acting as another product of modern football’s moral dislocation. Predictably, FA Chairman David Bernstein has accepted Ashley Cole’s remorseful personal apology whilst a bloodthirsty public are forced to believe in the genuine nature of his apology. Belatedly the FA have now launched a code of conduct which holds the power to suspend transgressors, but it remains to be seen how much of a deterrent it will prove to be. Until the core footballing values of this country are set right then the efficacy of the FA’s new centre of excellence will remain unfulfilled. 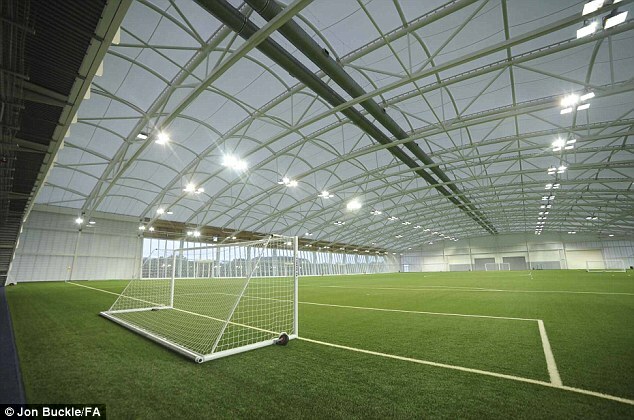 Indeed, some people now presume that with St. George’s Park open, its legacy will swiftly follow; a case of ‘if we build it they will come.’ It is one thing to possess a thriving training centre but to then presume that the centre alone will act as a coaching hub to ensure the future prosperity of English football is plain ignorant. Better facilities do not necessarily produce better coaches and the FA would do well to recognise that. To oversee a revolution of footballing values and technical ability the FA would require rigorous leadership, something it has lacked for years. This is the same FA that punishes players for racial discrimination whilst outlining that the accused are not themselves racist. The same FA that deigned to punish a footballer for labelling another a ‘choc-ice.’ The same FA that allocated an FA Cup Semi Final to a stadium that possessed an outdated safety certificate. The same FA that took 23 years to take responsibility for such a disastrous decision. The FA cannot afford to wait a similar length of time to instigate measures that will bring the national game out of its stagnation. This entry was posted in Analysis and opinion and tagged ashley cole, england, FA, john terry, liverpool, luis suarez, michael owen, robert huth, Roy Hodgson, st george's, stoke city, tony pulis by James Dutton. Bookmark the permalink.